A marble' is a small spherical toy usually made from glass, clay, steel, plastic or agate. These balls vary in size. Most commonly, they are about 1/2 inch to 1 inch (1.3 to 2.54 cm) in diameter, but they may range from less than 1/30 inch (0.111 cm) to over 3 inches (7.75 cm), while some art glass marbles for display purposes are over 12 inches (30 cm) wide. 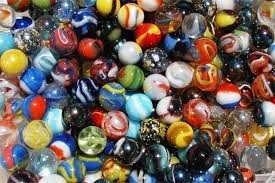 Marbles can be used for a variety of games called marbles. They are often collected, both for nostalgia and for their aesthetic colours. In the North of England the objects and the game are called "taws", with larger taws being called bottle washers after the use of a marble in Codd-neck bottles.